CoolSculpting is a revolutionary non-surgical contouring treatment that freezes stubborn fat, which then is naturally eliminated from your body. Only CoolSculpting targets fat cells alone, eliminating them in an easy, non-intrusive fashion that exercise and diet can’t achieve as quickly or as effectively. With results that are similar to liposuction, CoolSculpting is a fantastic option for fat loss and reduction and the treatment is completely non-invasive. While CoolSculpting is not a weight loss solution for people who are obese, however it can be used as a non-surgical liposuction substitute. The best candidates for this treatment have noticeable bulges in troublesome areas that they would like to eliminate. During your first one-on-one consultation, our doctors will determine if the treatment is a right fit for you. The CoolSculpting treatment is ideal for the areas of the body that have pinchable fat. This includes fat bulges on the love handles, back, chin, back, outer thighs, stomach and abdomen area, and upper arms. These areas are particularly difficult to treat and target with the combination of strict diet and exercise. 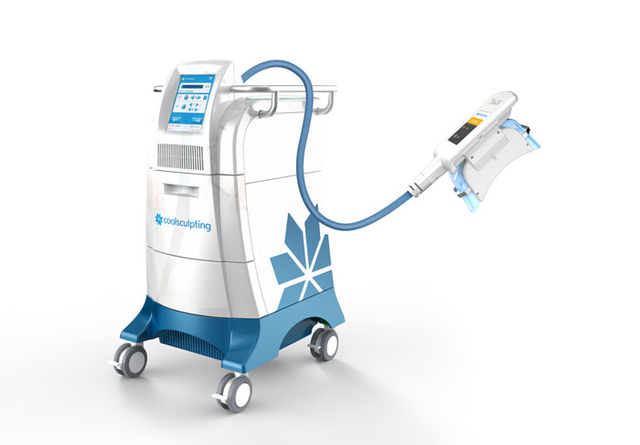 The revolutionary CoolSculpting technology delivers very precise, controlled cooling to effectively target the fat cells located underneath the skin. The fat cells in the treated area are crystallized and frozen through the process of Cryolipolysis, which leaves a more contoured, sculpted you. 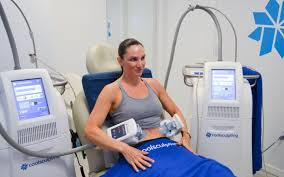 The reduction of fat cells with this freezing method coins the term of “freezing fat away” as the frozen cells are dramatically reduced without the user experiencing any damage to surrounding tissue, nerves, skin, and muscle. 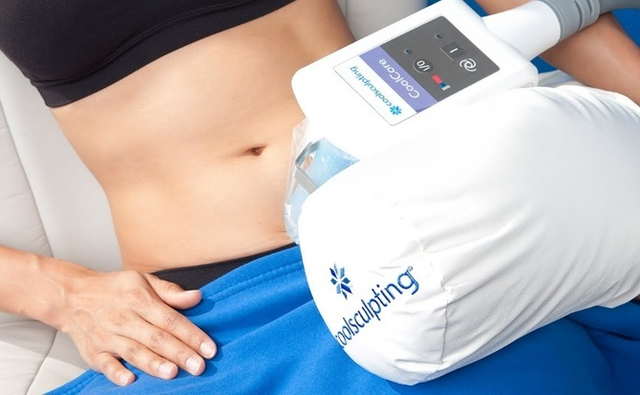 The non-invasive CoolSculpting treatment takes 1 hour per area to complete. For best results, 1-2 sessions are typically required. When you come in for the CoolSculpting treatment, a cool gel pad will be applied to the skin. You will feel a suction from the hand piece of the equipment, which is a necessary step in the fat treatment. You will not feel uncomfortable in the slightest, as the hand piece will not move for the whole hour once it is applied to the skin. As the cooling begins during the first few minutes, you will feel pressure and intense cold, which will dissipate shortly thereafter. Many people read, work on their laptop, or even take a nap during their treatment. Afterwards, you will receive a brief massage on the treatment area and you may experience some numbness for a few weeks post treatment. Because the suction of the applicator during the CoolSculpting process can be quite strong, we recommend avoiding any anti-inflammatories, such as aspirin or Advil one week prior to your treatment day in order to reduce the risk of bruising after the procedure. On treatment day, you will find it more comfortable to dress in loose fitting clothes that allow for adequate access to areas you are having treated. You may also want to bring something to entertain yourself during the procedure. Because it can take several hours to complete, it may be a great time to read a book or watch a movie on our TV. For those with these conditions, CoolSculpting could cause serious complications. It is imperative to speak to your doctor before seeking this type of treatment whether or not you have these pre-existing conditions. With no downtime, needles, anesthesia, or surgery, you will be back to work the same day as your CoolSculpting treatment. After your first visit us, you will typically see a noticeable reduction of fat. Many clients see results as early as 4 weeks, but the full effects of the treatment can be seen within 13 weeks. This is primarily due to the fact that it takes this long for your body to naturally dispose of the fat cells. You will experience the best results 3 months post-treatment, but your body will continue to flush out the fat cells and will continue doing so for up to six months post-treatment. Many patients are able to return to work immediately after the CoolSculpting treatment. For a few weeks following treatment, the area may feel numb while the fat is being eliminated from your body. While there is no downtime with CoolSculpting, bruising is possible. However, clients more commonly report redness and tenderness in the area. If you are considering to do more than one session on the same treatment area, it is best to do it in 4-week intervals. Your doctor will work with you to help you lose even more with additional appointments if they deem it necessary. Because the CoolSculpting procedure is completely non-surgical, you are typically able to return to normal activities right away. While some patients may experience redness, minor bruising, tingling, numbness or discomfort in the treated area, this is temporary and should resolve on its own. Often times, patients return to work after their CoolSculpting session is over. The results from the CoolSculpting procedure are permanent as long as you maintain a healthy diet and body weight afterwards. CoolSculpting freezes fat cells, which ultimately die and are eliminated by the natural processes that happen in the body. This is why it can take several weeks for you to see your final CoolSculpting results. Once the fat is gone, it is gone– unless, of course, you gain more weight after your treatment. For that reason, it’s important to maintain a healthy lifestyle after having any body contouring procedure. In fact, many people feel even more motivated to stay close to their ideal weight after seeing the results from their CoolSculpting procedure. If you are interested in undergoing a CoolSculpting procedure, ensure that you are consulting an expert at The Centre for Dermatology for best results.